Shane Beschen is one of the more successful post-pro career stories out there. His illustrious competitive life peaked in the ‘90s and included several domestic titles (back when the USA had a tour), three perfect 10s in one heat and an infamous unmasking of Kelly Slater’s darker side at the US Open. Now he writes, consults and coaches. Most deck jockeys and social media junkies know him for his sizzling coaching tips. The man peppers LinkedIn, Instagram and elsewhere with short, sweet video clips and words of advice. Articulate and totally in touch with his audience, he has a knack for making anyone believe they can master a full-wrap cutback. But most importantly, through our wave-pool lense anyway, he is deeply involved in Playground Surf. The company is the North American distributor for Citywave’s standing wave technology. The design just signed on to bring America it’s first Citywave for a project in Washington state. Many in the industry are saying it will be the go-to pool design for projects with limited space. There is a difference between standing wave pools and waves pushed out by a foil (like KSWC) or a giant plunger (Surf Lakes). First, you don’t have to paddle into a Citywave. You acid drop or sit on the coping then slide to your feet. Water rushes over a specially designed bottom contour to form a wave of varying sizes. The pressure and speed of the water can be adjusted to change the wave’s height and force. Modern Current from LIEBER FILMS on Vimeo. I work for the Red Bull high performance division, working with Red Bull’s surfing athletes on various skill sets. We’ve done air camps where we focus on air awareness and try to create that muscle memory for those split second moments in the ocean. I’ve also worked with Carissa Moore, Kolohe Andino, Jordy Smith and Julian Wilson at different points in their careers. I have been working with Citywave for over six years, helping them to elevate their presence in the wave pool world and also to help facilitate sales in America. When we started WavePoolMag we originally excluded standing waves. How does surfing a standing wave compare to other wave pools? Standing waves are obviously different than paddle-in waves due to the fact that the water is coming at you, but with the Citywave being a deep-water standing wave, it allows for real surfboards and fins which allows you to get a similar feeling when doing big carves. In 2016 you told Surfline: “I saw the evolution and I saw how good the wave can be. It’s super cool to go back a year later and ride the same product but have it be basically twice as good.” – has it changed even more since then? The Citywave has made subtle adjustments in the last six years to really improve the power and smoothness of the wave. We all get how the repetition can really help you nail a move, but what are some of the other, oft-overlooked benefits to standing waves? The benefit I see with the Citywave is how the spectators can be so close to the action, which creates a very fun and exciting environment for everyone. It also takes a fraction of the space need for big pools which allows it to penetrate more populated markets. After hard hours of coaching, it’s important to remember that sponging a few with your kid always matters. Image by Citywave. Do you see wave pools going the skate park route: For example skaters have choices of which skatepark style they like: street, bowl, ramp, etc – do you see a similar thing happening with wave pools? Could we even have segmented disciplines in surfing? Pool surfers, standing wave surfers, wake surfers, ocean surfers, etc? I see the wave pool industry like the beginning of the ski resort industry, when the first chair lifts were being put on mountains. Surf resorts will be a thing of the future just like ski resorts. I already see all the different disciplines in surf and I think for most surfers, they will want to try and learn all of them. 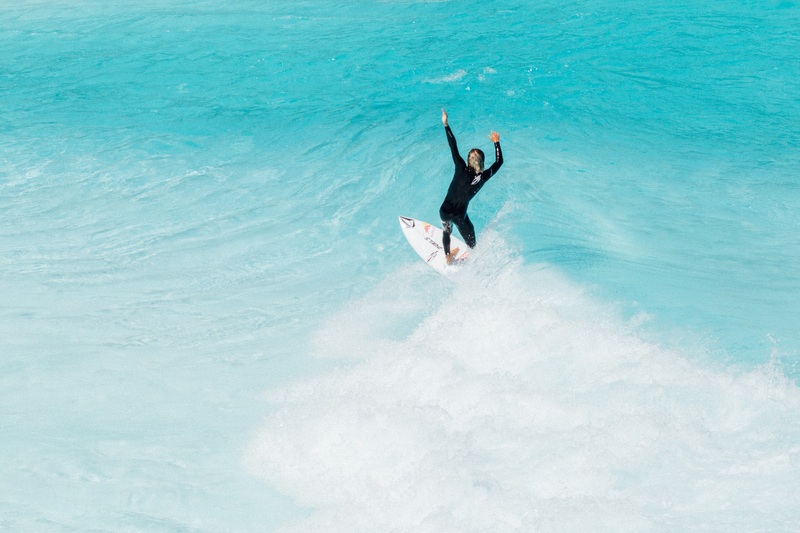 It’s really about having fun surfing in many different ways. I think we’ll see all kinds of modifications in these surf pools as the industry evolves but I think the quality of the wave will always come as a first priority. Finally, fast forward 10 years: Do you see an emerging wave pool culture, separate from surf culture? I think wave pools will work their way into surf culture as many surfer’s have already gone out of their way to ride wave pools. Waco was fully booked last year and many were flying there to check it out. Surf culture will just expand past oceans and borders.